You may have sometimes faced various issues while installing tweaks on Electra jailbreak. If you undoubtedly have; then you can make use of a new tool known as Tweak Installer, which enables you to install unlimited tweaks with just a few clicks. Tweak installer is a desktop-based toolkit for Electra development which was designed and developed by Joseph Walden for solving the various issues related to the installation of tweaks to your device. Along with tweaks, this excellent tool also enables you to install multiple themes also on your iOS device with the help of SFTP. Tweak installer only works on Windows operating system, but it is not like that you can never afford this fantastic application on Mac or Linux operating systems. Developers are continuously working to get this app on these devices as well. Now, just do not get panic if you are not able to access your jailbreak device or failing in installing various tweaks on it. Just get your phone installed with Tweak installer and enjoy the unlimited fun with it. For knowing the concept in a better way; we are here going to provide you brief details about the same. 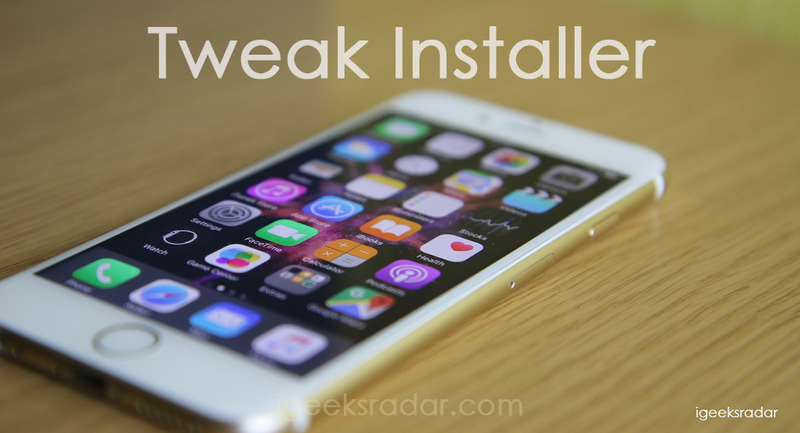 What is Tweak Installer and how does it work? Tweak installer is a PC based Debian package installer for Electra development toolkit which enables you to install various tweaks and themes on your device just with the help of few clicks. This fantastic tool was designed and developed by Joseph Walden which uses SFTP for the installation process. Another best thing about this application tool is the ensured safety and protection it offers to the users during the installation process. It ensures the transferring of all the associated files to the correct locations only. The working of this wonderful tool is quite simple and easy to understand. First of all the Tweak Installer establishes an SFTP connection with your targeted device. Then it converts the Deb file to an installable format so that you can easily get it on your device. Once done; now it starts automatically transferring the Deb file into the required locations on your iOS device’s filesystem. Nice Read: Circuit Breaker for iOS | Electra Jailbreak Management App iPhone/iPad. Windows operating system: The Tweak Installer is compatible with Windows operating system version 2.0, version 1.2, version 1.1, version 1.0, Beta 8, Beta 7, Beta 6, and Beta 2. Mac operating system: The Tweak Installer is compatible with the Beta 2 version of the Mac operating system. An iOS device working on iOS 11 – 11.1.2. Jailbreak along with SFTP accessing. Working internet connection or secure WiFi connection. Tweaks Time: Immortal Cydia Tweak to Sign IPA Files Forever No App Limit 2018. Open the web browser and search for the option of Debian package for tweaks and themes there or Download from below links. 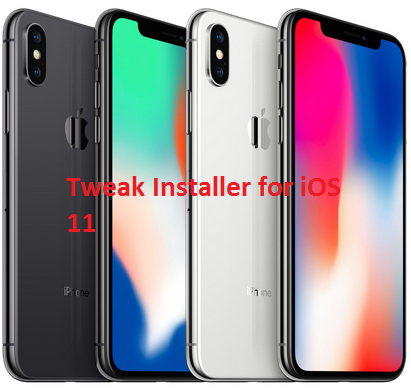 Tweak Installer V2.0 Download for Windows & Tweak Installer Beta 2(Mac) Download. Once found; download the zip archive to your device from there and then extract it to any location of your computer system. 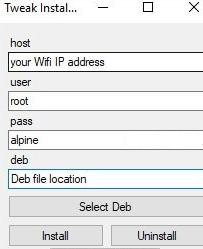 Host: for which you need to add your WiFi IP address properly in the dedicated column. User: for which you have to add root. And deb: for which you have to add the Deb file location. You can directly add your localhost in the provided box and then connect your computer system to your iOS device through dedicated USB cable. Once you have successfully filled up all the fields carefully; then just click Install to start the installation process. The installation process will get complete in few minutes. Once done with it; just launch the Tweak Installer and then enjoy downloading various tweaks and themes on your device. If you are not willing to have any tweak on your iOS device and wanted to uninstall it, you can quickly do it by just pressing the Uninstall option. But before going forward with the uninstallation process; we recommend you to back up and save all the tweaks you have installed on your PC or computer system in order to get it back soon if anytime needed. Best Emulator: GBA4iOS on iOS 12/11.3 & iOS 11/10+ iPhone/iPad 2018 Updated. Tweak Installer is an application which enables you to enjoy installing various tweaks and themes within just a few clicks. It is a perfect app for all the jailbreak devices and works efficiently on Windows operating system. We have discussed you, in brief, the efficient methods of installing and uninstalling this app on your device. So, just get ready for installing various tweaks and themes on your iOS device if striking with an issue.